One of the undergirding principles of life in Falmouth Jewish Congregation is our desire to build and maintain community. We strive to do so in many ways, one of which is by providing a name-tag for each member of our congregation and encouraging them to wear it whenever they find themselves at FJC. It has been several years since we implemented this project, commissioning a special cabinet (found in Speen Hall corridor) to accommodate these name-tags (in alphabetical order, by last name). Over the course of that time many have expressed appreciation for the opportunity to finally associate a face with a name or to avoid the embarrassment that we all suffer when we simply cannot summon up the name of someone we see at FJC. To the extent that members wear their tags, it has been a great boon to our community. • Members do not think to stop and claim their name-tag when they arrive at FJC. • Members forget to return their name-tags before leaving the building. • Name-tags get returned to the wrong drawer or misplaced within a drawer. • Members who have opted to use a lanyard attached to their tag fail to wrap the lanyard around the tag before returning it to its proper slot in the drawer. Think about how often you’ve appreciated seeing a fellow member wearing a name-tag, affording you the opportunity to address them by name, something that all of us find meaningful. This simple device functions as a particularly effective form of “social glue”, binding us as a community of people who, over time, truly come to know one another….and knowing one another is but a step on the path to caring for one another. • Name-tags can be clipped on or worn with an attachable (thin) lanyard. If you do not have a lanyard and would like one, speak to any staff member and we’ll be happy to attach one to your tag. 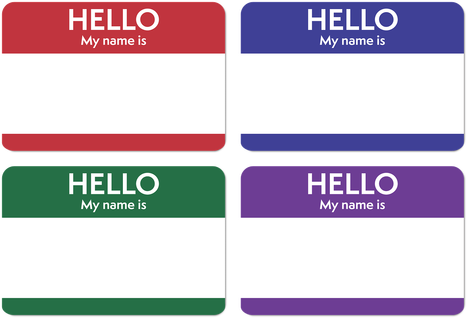 • If you have a nickname that you’d prefer to have on your name-tag, please bring your tag to the attention of Betty Klotz, our Office Administrator. • If your name-tag has a lanyard, please wrap it around the tag before returning it to its slot. • Please look carefully to make sure your tag is returned to the proper drawer and proper slot within that drawer. • Most importantly….find and wear your name-tag at all FJC functions! No system is perfect and, over time, chaos slips its foot in the door. If you would consider volunteering to undertake a monthly or bi-monthly straightening of the name-tag drawers, please notify the temple office. Keeping our name-tags in proper order will greatly facilitate their usage and reduce the frustration of seeking, but not finding, your name-tag. What’s in a name(tag)? A great deal that is important to building and sustaining community at FJC!